Do you long to experience true fellowship with the Holy Spirit. Ever wonder if it's really possible to hear God's voice guiding you, and feel His presence comforting you every single day? In this powerful 2 part class you'll learn the truth about the Holy Spirit: Who He is, why He's here, and how you can experience more of His presence that you're thirsting for. 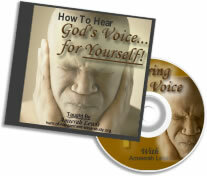 Then, you'll discover how to truly hear the voice of God speaking into your daily life. You CAN begin living your life in constant fellowship with the Holy Spirit today! Lesson 3: The Veil - Punishment or Protection? Experiencing a fresh outpouring of the presence of God in your life can and will transform you and your circumstances. Yet many Believers still feel as if an unseen veil separates them from connecting with the Holy Spirit. Discover the truth about the Veil and why it doesn't have to separate you from God ever again! Your Heavenly Father invites you to come boldly into His Presence. But, do you? Or do you sometimes feel uncomfortable or unworthy to enter into the Presence of the Lord? Find out why the only veil still separating you from more fellowship with the Holy Spirit is the one in your mind. What's keeping you out of the Presence of God? When it comes to keeping you and your Heavenly Father at a distance, what's your enemy's weapon of choice? Discover how to identify the chains that have been keeping you bound, and how to break free and experience an outpouring of God's Spirit in your daily life. Lesson 1: Excuse Me, God...Which Way Towards My Destiny? Is it even Biblical to think that we should be able to know the actual will of God? Discover some of the reasons you may not be able to hear God's voice and exactly why it's so important that you do! Convinced yet that God's will is for you to be able to hear His voice? Or, are you still relying on human beings to speak into your life instead of your own ability to hear the voice of God for yourself? God has promised you, as His sheep, the ability to hear and recognize His voice, but HOW? What are ways that God speaks to you each day, and how can you begin to recognize His voice? Discover how to truly Listen to the voice of God, and why putting His voice before your own opens you up to experience the peace and joy that God has in store for you? God has promised you as His child the ability to hear His voice speaking into your daily life. So, why do so few Believers experience this kind of fellowship with the Holy Spirit? 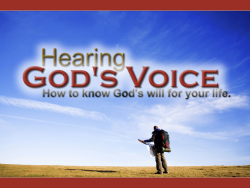 Find out the secrets to hearing God's voice that every Believer should know. Discover some of the biggest mistakes made by most Christians that stop them from receiving God's voice, and specific things that you can do daily to make sure you never miss what He has to say to you. What is the biggest roadblock stopping most Christians from hearing and following the voice of God? 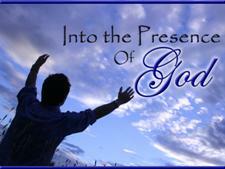 And how can you as a Believer press in and receive the gift of God's voice. Plus, take the special Seeker's Challenge that will open you up allow the healing voice of God to begin speaking into your daily life! Do you long to be totally submerged in God's transformational presence and to feel covered in His love? 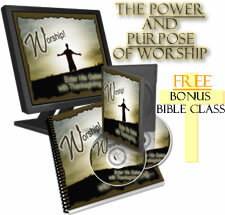 Rediscover this powerful weapon ~ Experience the explosive power of Worship. In this class you'll discover the true purpose of your worship, and how it can begin loosing the chains that the enemy has put on you. You'll find out what it really means to worship God "in spirit and in truth." Then, you will learn how to set up your own Personal Worship Encounter with with Lord and experience the fullness of His presence. with your class on fellowhip with the Holy Spirit! To Help You Enter True Fellowship with the Holy Spirit! and thrust you into a Relationship with God. and what that means to YOU today." Ameerah Lewis is the founder of The Hem of His garment Bible Studies, an author and a respected Bible teacher. But, even more than that, she is a devout student of God's Word and His Holy Spirit. A former high school teacher, she now devotes most of her time to teaching God's promises to His children, a calling that she doesn't take lightly. Known for her special gift of breaking down the Word of God in a powerful and practical way, Ameerah teaches hungry believers how to apply the Bible to their daily lives. She challenges each of us to take off our "Perfect Christian Mask," and allow our Heavenly Father into those hidden areas of our lives. "I'm not big on theology," Ameerah explains. "I'm big on developing an intimate relationship with God through His Word." She believes that God's Word is alive, and that it has the power to change us and our circumstance. "I've learned through all of the challenges I've faced - whether health related, financial, emotional, or otherwise - when we seek God first, everything else falls into place..."
Want a Sneak Peek at What's Going On Inside? A Free Webclass * A Free eBook * And more! 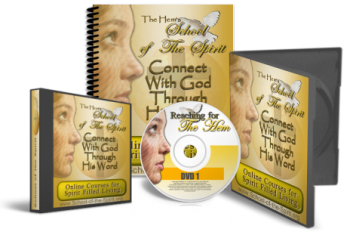 Already enrolled in The Hem's School of the Spirit?